1) what does' Eye Of Heaven' refer to? The expression 'eye of Heaven' refers to the sun. 2) how is the gold complexion of the sun dimmed? The gold complexion of the sun is dimmed by the clouds..
3) what is meant by 'summer's lease'? The expression' summer's lease' means the duration of the summer. 4) what will make the beauty of the poet's friend eternal? The verse will make the beauty of the poets friend eternal. 5) what shall death not brag of Shakespeare 's sonnet no 18? Death shall not brag about taking the poet's friend into his shade. 6) what does Shakespeare compare his friend to? Shakespeare compares his friend to a summer's day. 7) whose complexion is referred to in Sonnet no 18? The gold complexion of the Sun is referred to in Sonnet no 18. 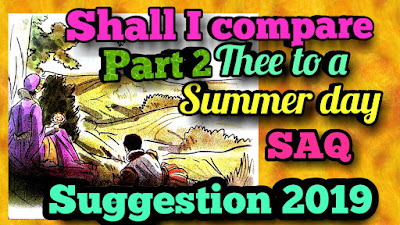 8)' shall I compare thee to a summer's day' - - does the speaker think the comparison proper or worthy? The speaker does not think that the comparison is appropriate because his friend is more beautiful and temperate. 9) what shakes the darling buds of May? The rough winds of Summer shake the darling buds of May. 10)' But thy eternal summer shall not fade' - - what does the word 'summer' refer to here? Here the word 'summer' refers to the beauty and youth fullness of the poet's friend. 11) what does the expression 'eternal lines' refer to? The expression 'eternal lines' refers to the poem or the Sonnet written by the poet. 12) whom is Sonnet no 18 addressed to ? Sonnet no 18 is addressed to the poet's friend, a fair youth. 13) what season is mentioned in Sonnet no 18? The season of Summer is mentioned in Sonnet no 18. 14) whose summer is described as eternal in Shakespeare's Sonnet no 18? the summer of the youth of the poet's friend is described as eternal in Shakespeare's Sonnet number 18. 15) how does the poet's friend surpass a Summer Day? The poet's friend surpasses a summer's day in loveliness and temperance. 16) what makes' every fair from fair' decline? Chance or the changing course of nature makes every fair from fair decline. 17) how does the' eye of Heaven' sometimes shine in summer? Sometimes the eye of Heaven or the sun shines too hot in summer. 18) how is the complexion of Sun described in Sonnet no 18? The complexion of the sun is described as Golden in Sonnet number 18. 19) what, according to the poet, will his friend not lose? According to the poet his friend will not lose the fairness that he possesses. 20) how is death personified in Sonnet no 18? Death is personified in Sonnet no 18 as a boastful person who forces everyone into his embrace. 21) where, according to the poem, has his friend grown? According to the poet, his friend has grown in the eternal lines of his poem. 22) what will 'give life' to the poet's friend? The Sonnet 18 or the everlasting quality of poetry will give life to the poet's friend. 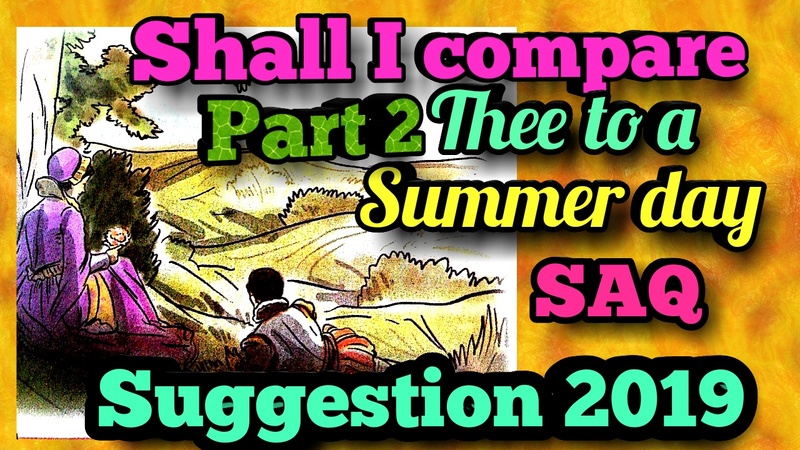 23) what are the shortcomings of the summer in comparison to the poet's friend? The beauty of Summer is subject to change, and it is rough and hot, while the beauty of the poet's friend is constant and immortal. 24) what are the drawbacks of a summer day? Besides being extremely hot or cloudy, a summer's day may spoil beautiful buds with the help of rough winds. 25) why is the friend's beauty called more temperate than summer? The beauty of the friend is called more temperate than summer because Unlike the summer's day, it is more consistent and sustainable. 26) what is meant by' thy eternal summer '? The expression' the eternal summer' refers to the eternal youth and beauty of the poets friend. 27) why does the poet begin the poem with a question? The poet begins with an indicative question to convince The reader that the beauty of his friend is beyond comparison.